Republican presidential candidate Rudy Giuliani reaffirmed his "passionate" support for abortion rights and argued against picking Supreme Court nominees based on their view of the ruling that legalized abortion. "My view is that there shouldn't be a litmus test on Roe against Wade," the former New York City mayor said. "I'm going to select strict constructionist judges. They're free to take a look at Roe against Wade, take a look at the limitations, but I believe I should leave it to them to decide that." Giuliani repeatedly has defended his positions, which have been criticized as contradictory, on late-term abortion, public funding for abortions and the Roe v. Wade decision. "I'm very, very passionate about the issue of abortion," he said. "I oppose it. That's a principle I've held forever, and I'll hold it forever. That's not going to change. But I also believe that in a society like ours, where people have very, very consciences about this, it's best to respect each others' differences and allow for choice." For Republican conservatives who could determine the outcome in the primaries, opposition to abortion has been a litmus test. 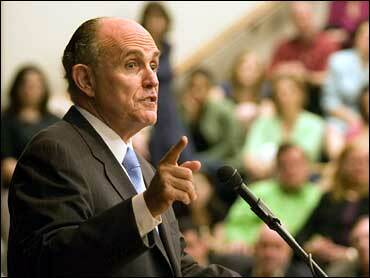 Giuliani's support for abortion rights has drawn criticism from some in the party. One president rival, former Massachusetts Gov. Mitt Romney, has drawn complaints for his switch from supporting abortion rights to opposing the procedure. Another rival, Kansas Sen. Sam Brownback, has said that an abortion-rights Republican would have trouble winning the nomination. Giuliani's interview on "Fox New Sunday" was broadcast Sunday.